Raw Persimmon Pudding is one of the most delicious deserts I have ever partaken of, perhaps the best. It can take a little tweaking with the ingredients to get the desired consistency you’re looking for, but I found it always tastes great and is fun to make. Cut open the persimmons and remove any seeds. Open the young coconut pour off the water and reserve. Spoon out the flesh of the coconut into the blender and add the persimmon with about 1/3 cup of the coco water and blend. Add more coco water as needed. Spoon out persimmon pudding into small bowls and sprinkle with cinnamon and a sprig of fresh mint. If you want this to be a firm pudding add some ground chia or flax seed and blend in thoroughly. 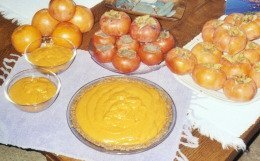 This persimmon pudding could be put into a pie crust and chilled before serving as a wonderful persimmon pudding pie. **Important note ~ Hachiya persimmons should be very soft to the touch and almost translucent when eaten. They are very bitter if eaten prematurely. Ask your farmer or local produce worker to help you choose ripe fruit. Join in and write your own page! It's easy to do. How? Simply click here to return to Raw Dessert Recipes.